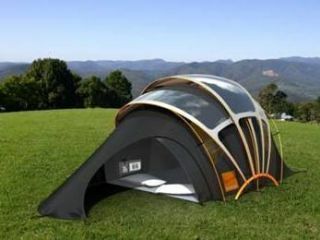 Plus new 'photovoltaic' solar tent for Glastonbury... 2010? Orange is certainly not a company to miss the PR opportunity that has become the 'product X essential at Glastonbury' news release, announcing a new GlastoNav mobile app today AND a new photovoltaic tent fabric that powers-up your gadgets at the festival. First up is the Orange GlastoNav application, a free mobile download that claims to offer "Glastonbury revellers with the ultimate interactive festival planner". The Orange GlastoNav mobile app has been developed in partnership with the Guardian Guide, offering "the ability to personalise your very own artist schedule for the whole weekend, an interactive map of the site as well as essential festival news, advice and alerts." And if that wasn't enough already, Orange has also announced the Orange Solar Concept Tent which is made from a new "innovative photovoltaic solar fabric predicted to revolutionise the festival camping experience." Orange's Glastonbury PR love-in continues, with the latest press release boldly exclaiming: "Having worked closely with Glastonbury for the last eleven years, Orange know the importance of keeping in contact with friends while onsite and undertook this concept project to look at how the festival goers communication and power supply needs might be met in the future. Orange's latest concept tent is made from photovoltaic fabric which weaves "specially coated solar threads into conventional fabric," which means that "revolutionary new ways of capturing the sun's energy could soon become a reality." The tent's directional glides move to maximise its solar efficiency and "would be fitted with innovative '[glo-cation' technology" so your mobile phone can identify your tent by making it glow via SMS or RFID. The tent also provides a wireless internet signal and hub with a wireless charging pouch using 'magnetic induction' tech to ensure your mobile phones and iPods need never run out of juice. Finally, there is an internal heating element in the tent's groundsheet to keep you nice and toasty when it's wet, windy and cold out there in the wilds of deepest Somerset. "The development of photovoltaic fabric will revolutionise festival tent design," thinks concept tent designer Finn McKenty, adding, "in working with Orange we have created a vision for a solar tent that we believe is a great glimpse of what's to come." Shame it's still only at concept stage, but you can see it at: www.orange.co.uk/glastonbury. Still, if you are going to Glastonbury this weekend, TechRadar recommends that you rely on the age-old technology of making sure you keep a pencil and notepad in your back pocket at all times with essential numbers and meeting places/times scrawled in it.